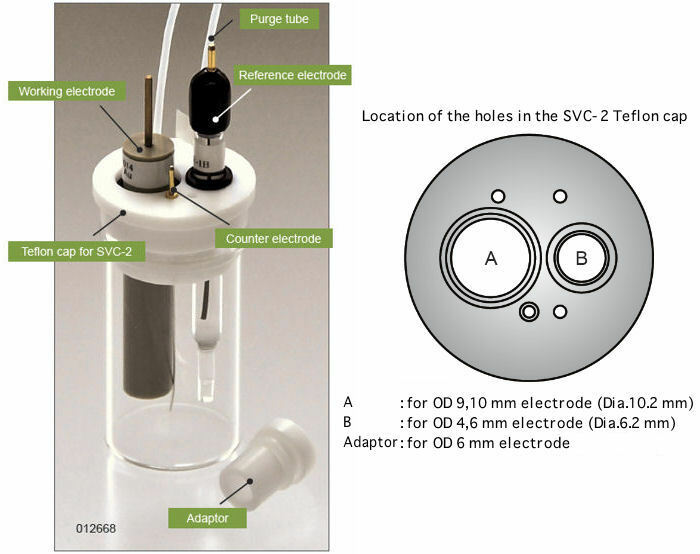 SVC-2 Voltammetry cell can be used for 4 modes voltammetry cell setup. 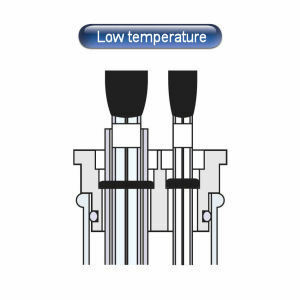 Each voltammetry cell has its specific feature. However, SVC-2 can be sed in 4 modes. Also can apply as an oxygen-free voltammetry cell. 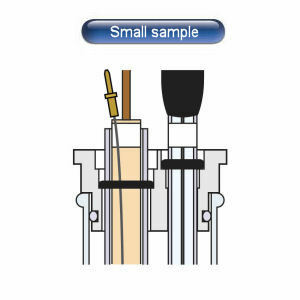 Setting the sample holder of 9.0 mm of the diameter , it enables small sample measurement (100 - 200 uL). Set the Teflon cap adaptor to the Teflon cap. The Teflon cap adaptor is fixed with a silicon O-ring　to work in an oxygen-free condiction. If you do not need the oxygen-free condiction, then the silicon O-ring can be taken out from the Teflon cap. Take out the Teflon cap adaptor from the Teflon cap. 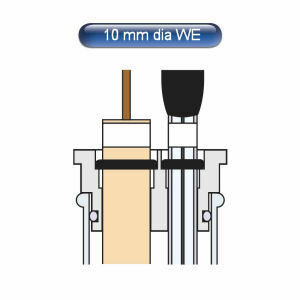 Working electrode can be fitted directly to the Teflon cap. The O-ring will fit perfectly. It permits to have the oxygen-free condition. Take out the Teflon cap adaptor from the Teflon cap, and set the Sample holder of the 9.0 mm of the diameter (optional item). Set the working electrode and counter electrode into the Sample holder. Do not work in a oxygen-free condition. 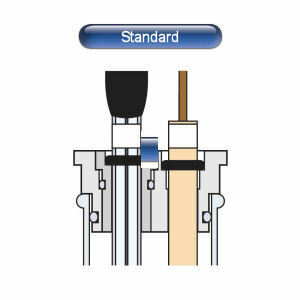 Take out the Teflon cap adaptor, and set the Sample holder of the 9.0 mm diameter (optional item). Set the reference electrode into the sample holder. Working electrode and reference electrode are sold separately. Each component could be purchased separately.